Some trends are hard to resist, some you regret (maybe not a first) and others you hate to see fade away. The monogrammed initial necklace trend is one I love (at least at the moment). I wear my necklace so much it's become my gang sign, soon I'll start wearing a pink bandanna (throw my gang colors around). I found my necklace on Etsy (which is my crack, and with today's post I'm pushing my crack) at www.etsy.com/shopBestPerjewelry they have different font choices, chain lengths (from 14" to 22'), gold or silver, and different sizes of monograms (mine is 1.5" on a 16" gold chain). Their prices are outstanding (mine was $51.95). I love wearing it alone or layering with other pieces (it's fun to wear with a bubble necklace or pearls). They have monogrammed bracelets too!!! I've said before tattoos are not my thing (unless their on a hot man) but I'm starting to think these monogrammed necklaces may be more like my tattoo than gang sign. 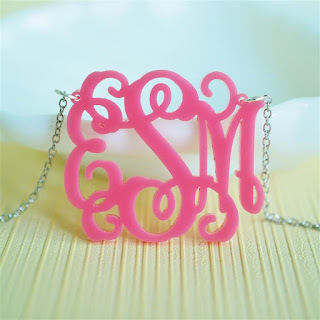 The few people I know who have tattoos say you can't get just one...well I'm one my third monogrammed necklace. 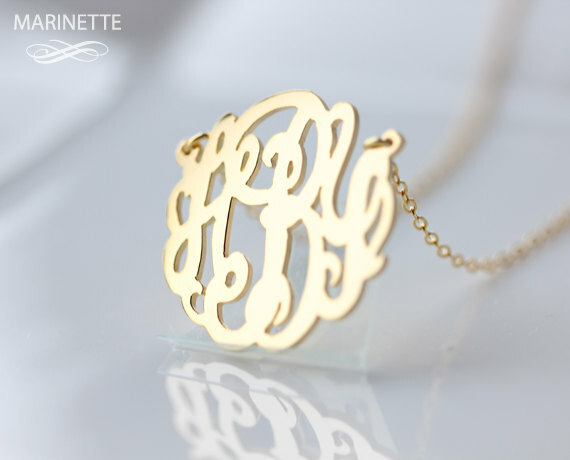 What do you do once you have a gold monogrammed necklace and you are still needing a fix...ACRYLIC. For me it was tortoise acrylic and pink. I'll stop when my neck is covered in monogrammed necklace's...I'm committed to the lifestyle. I found my acrylic monogrammed necklaces at...you guessed it, Etsy. ElizaJayCharm (www.etsy.com/shop/ElizaJayCharm ) is beyond affordable and offers tons of options. My 1.5" acrylic necklace's was $28.95 and again you can pick the chain color (gold or silver), different fonts, size, plus they have twenty different color selections. I did mention I was pushing my crack in this post, I love Etsy. You get to support small business (lots of which are owned by women), and it's full of millions of creative people selling their fabulous creations. What's not to love. Hey Judge, I need this when I go out shooting (remember that beautiful Silver Pigeon 12 gauge shotgun). I know you're shocked no monogram. I do love a pretty slipcover. Again this shop is on Etsy and WOW they have gorgeous tablecloths, ottoman covers, seat covers, blankets, Christmas stockings, and on and on. 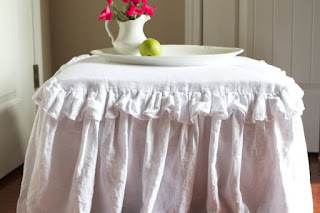 I have several slipcovers all over my home (chairs, ottomans, benches, couch, more chairs, lampshades) and they are all beautifully made but I didn't pay $74.95 for any of them (that's the price of the ottoman cover). 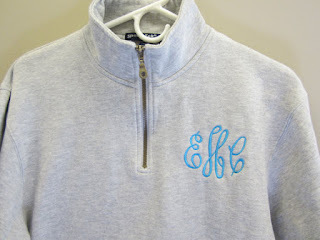 Monograms, slipcovers and seersucker...I could make that my gang motto. 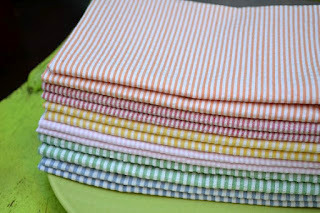 These seersucker cloth napkins are definitely on my wish list, I love the green and pink (they have 9 different colors to pick from). A set of 6, 18 inch napkins are $32. Is it still a gang if there's only one member? I might work on recruiting other monogram loving women to join my gang. To join you have to wear your initials proudly (on everything), love pink, prefer seersucker over silk, and stalk Etsy looking for the next "thing". What's your favorite Etsy purchase? I was in NO way compensated for this post. All of the items mentioned are based on personal experience. thanks for all the new-to-me etsy shops! I think my first etsy purchase was personalized stationery (gift). Since then, I have bought a couple of antique belt buckles, vintage needlepoint, a watercolor canvas, art prints and lots of monogrammed goodies.